Most people have some sensitivity to mold, which can cause irritation of respiratory passages and mild skin rashes. Those who are allergic to mold will experience more severe symptoms. These symptoms include coughing, lung infections, red, irritated eyes, hives, and asthma attacks. Chronic exposure to mold can cause mold allergies in those who previously only had mold sensitivity. The spores released by mold are the main culprit, which is why it is important to contain these spores when cleaning mold. Wetting the area before you scrub it will help keep spores from becoming airborne. For cleaning mold off most surfaces, you can use any commercial cleaner, a bleach-based household cleaner, or bleach and water solution, which is comprised of one parts laundry bleach to 10 parts water. Removing all visible mold is one of the most important steps, and most cleaning products can accomplish this. To kill remaining mold spores, use bleach or a commercial fungicide. Never mix bleach with other cleaners. Toxic gasses can form, especially if bleach is used with ammonia or ammonia-based cleaning products. If the mold has stained surfaces, such as grout, bleach-based cleaners are often the best option because they will lighten the stain. Dampen the moldy surface with water and then cover it with the cleaning product. Remember that you should always dampen moldy surfaces before scrubbing to prevent mold spores from releasing into the air. Wipe away excess cleaner and mold from the surfaces and then rinse the areas with clean water. Afterwards, apply a commercial fungicide or your bleach and water solution and leave it on the surface for several minutes. If you are using bleach and water, there is no need to rinse it off. If you are using a commercial product, follow the directions on the bottle. After you have finished cleaning the bathroom, dry the surfaces with clean towels and let the bathroom air out completely. To prevent mold on shower stalls and tile or glass walls and doors, consider spraying them with a water repellent product. Another way to prevent mold in bathtubs and showers is to keep them free of soap scum. Soap scum is comprised of soap residue and dead skin cells and body oils. Mold can thrive on this organic material. Avoid offering mold a feast of soap scum by switching to non-soap based body washes and by cleaning your shower stall and bathtub more frequently. In addition, make sure you use an exhaust fan in the room and open doors or windows after bathing to reduce humidity. Furnish and decorate your bathroom with mold prevention in mind. Avoid using items made of wicker or other porous and semi-porous materials. Flooring and wall covering should be nonporous and easy to clean. Wash moldy shower curtains, towels, bath mats and bath rugs in hot water with vinegar or bleach. You should do this before replacing these items in the bathroom or you will spread mold spores back onto your newly cleaned surfaces. Sometimes mold has stained grout so badly that bleach will not be able to do much good. In this case, it is usually best to remove the old grout and add new grout. 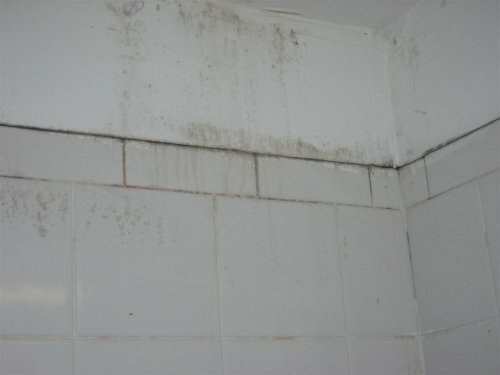 If moisture has seeped behind tiles and into the wall, mold growth there is almost certain. To eradicate mold in your walls, you will need to replace the moldy sections. Until you are able to do this, try to dry it out as much as you can by using dehumidifiers in the room and keep the area covered to prevent mold spores from getting into the air. Cleaning a moldy bathroom can be a time-consuming job if mold has taken over many surfaces. However, if you take measures to reduce humidity in the area, and keep it cleaner, you should not have to do this kind of mold removal very often. If mold continues to be a serious problem, it might be time to contact professionals to check out your home’s ventilation system or to add a whole-house dehumidifier.